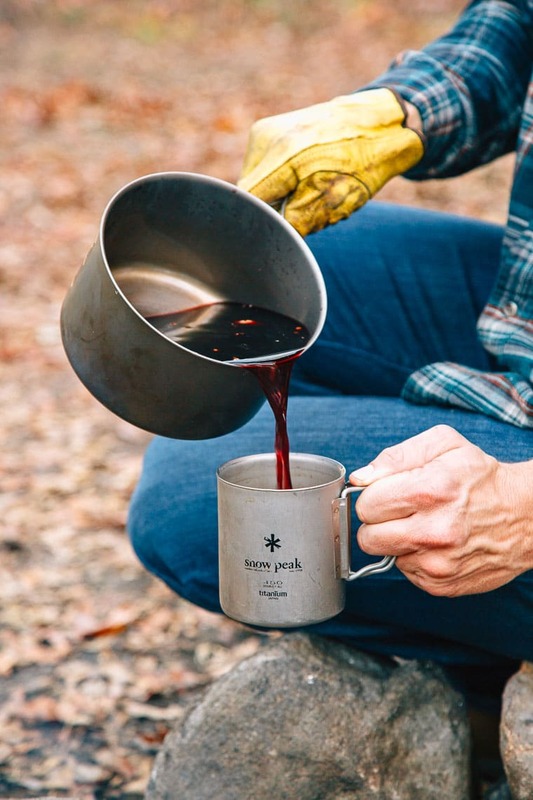 The wintery version of sangria, a camping mug full of mulled red wine is all we need to keep warm. There are few occasions that can’t be made better with a bottle of wine. But during the winter months, we find ourselves searching for something a little cozier. Enter warm mulled wine, or glühwein as it’s called in Germany. 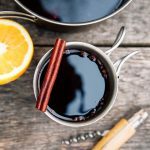 This spiced red wine cocktail is the perfect way to keep warm during this winter and smooth out any unexpected wrinkles that the holidays might throw your way. 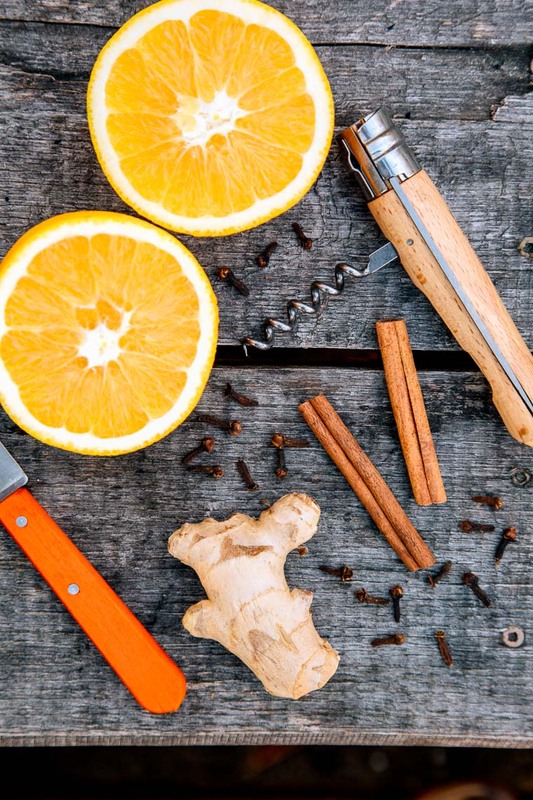 It doesn’t take much to make: a bottle (or two) of red wine, some oranges, cloves, cinnamon sticks, ginger, and few drizzles of maple syrup. Simmer in a big pot over low heat until all the flavors start to blend together. When it’s ready, it tastes like warm, liquid comfort in a mug. This is the perfect cocktail to try while doing some late-season camping or at the cabin during a winter ski trip. When the weather is brisk, this drink will be your best friend. 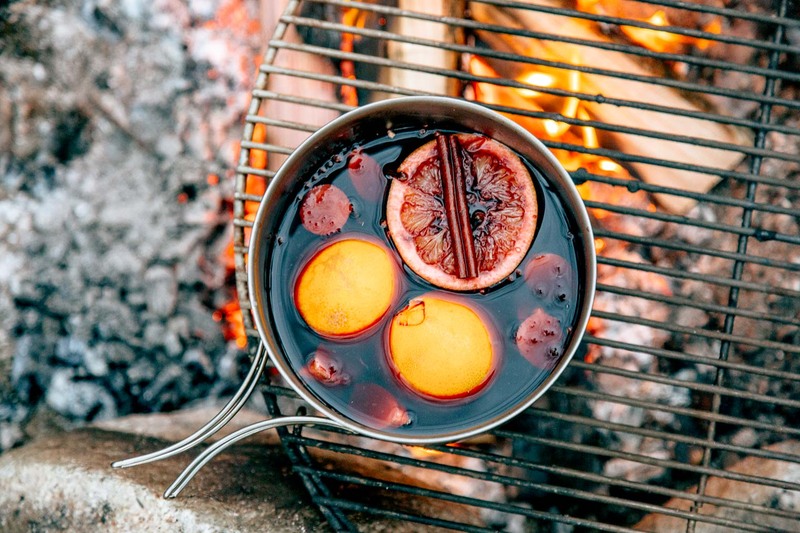 ‣ Mulled wine is perfect for large groups. Just fill up a big pot and let it simmer away. The long the ingredients have to simmer together, the most robust and complex the flavor. ‣ This cocktail can be made over any heat source. A two-burner camp stove, an open campfire, or even on top of a wood burning stove. ‣ This is a very flexible drink that allows some creative liberty. You can use any cheap red wine you can get your hands one. Add winter-themed spices plus whatever sweetener you have available, and you’re good to go. ‣ Use the whole cloves to stud the rind of the oranges. This will keep them attached to the fruit and out of your drink when it comes time to serve. ‣ Avoid accidentally boiling the wine. You’re looking for a very low simmer; just enough to keep everything warm. Once it starts to boil you’re just losing alcohol. ‣ Use a pot that can hold at least 40 fl oz (5 cups). A 750ml bottle of red wine comes out to be a little over 25 fl oz. Once you add the fruit slices it will fill the bottom up to about 32 fl oz. Go with the big pot, so you can come back for seconds! Combine the wine, maple syrup, and spices in a pot. Squeeze the juice from the oranges into the wine and then add the spent peels to the pot. Simmer over medium-low heat at least 30 minutes to allow all the flavors to meld. Split between glasses & enjoy! Wovv such a nice idea 😉 I Will try this wine in my first trekking. Thanks for sharing. 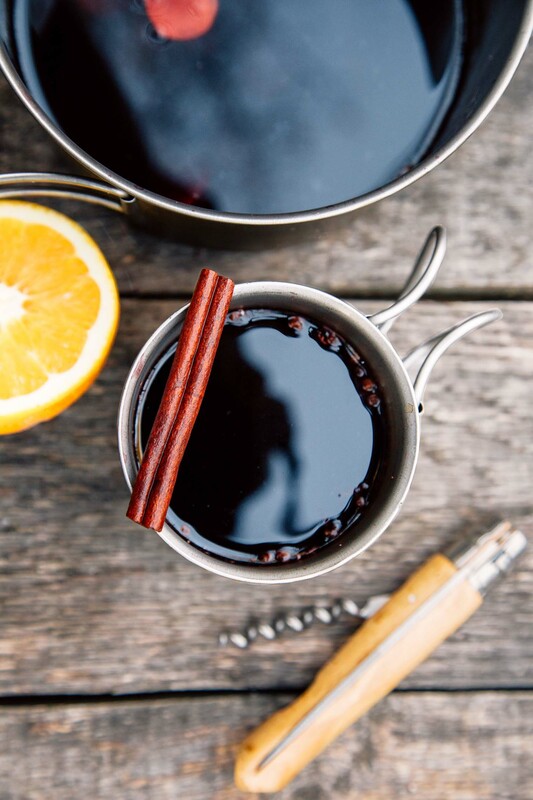 Warm, spiced wine is ALWAYS a good idea in our book! !